MT580s are the new black! 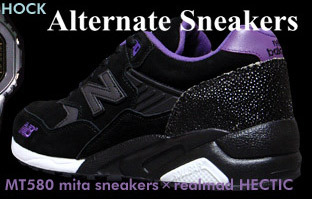 Mita x Real Mad Hectic are at it again, this time with Black/Black, Black/Blue, Black/Pink and Black/Purple colorways and a “Stingray” material on the heel. Also pictured below is the “Pesto” MT580 by the same folks with pesto green and splashes of neon yellow, pink, blue and orange. The Pesto and Black/Black are due in March, the rest in February. This entry was posted on Monday, January 29th, 2007 at 5:03 pm and is filed under All. You can follow any responses to this entry through the RSS 2.0 feed. Both comments and pings are currently closed. When do the blacks come out?